What is IBM Watson Customer Experience Analytics Mobile Basics Edition? An analytics platform that enables you to optimize your mobile apps by measuring and understanding user experience. With interaction analytics, customer experience scoring and heatmaps, you can pinpoint the root cause of issues, understand user behavior and enhance your apps to increase conversions. How does IBM Watson Customer Experience Analytics Mobile Basics Edition work? It consists of a client side SDK and a web dashboard. 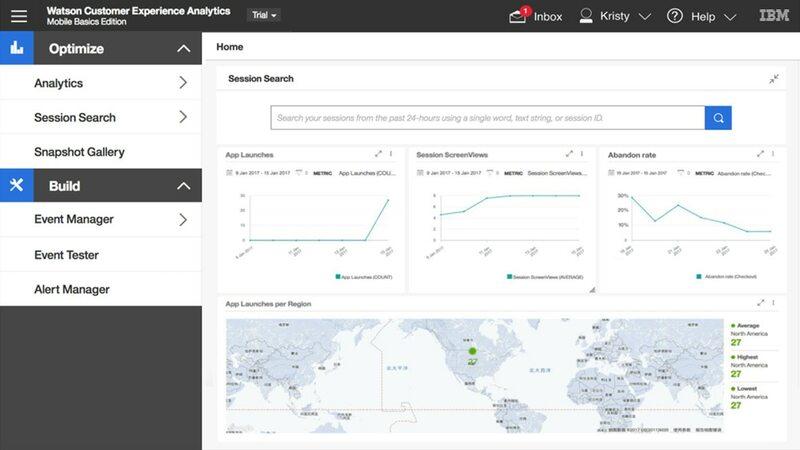 After integrating the Watson Customer Experience Analytics Mobile Basics Edition SDK into your iOS or Android app you will be able to view all tracked data (dashboards, out-of-the-box reports, session replay, heatmaps and interaction analytics). What is IBM Watson Customer Experience Analytics Mobile Basics Edition's pricing model? IBM works really close with customers to ensure their success. We offer different packages to meet client’s needs. Do users know that they are being tracked?